Homewood() The headquarters of southern grace and charm is about to become the locus of southern technology when Southern Progress Corporation opens the doors of its new Southern Innovation Center. The 'Hamster recently got a sneak peek at the center, which is housed in a radical new building on the Southern Progress campus. But we discovered that the building is not nearly as radical as some of the southern ideas and inventions contained inside. An enormous collection of actual southern tools and implements are on display within the Hall of Invention. Two centuries of spit cup development is lovingly detailed along the south wall. 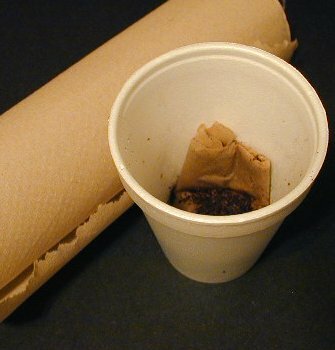 The display begins with a simple copper spittoon and culminates in the modern day Styrofoam® cup with paper towel. The signage explains that for decades southerners coped with the problem of a portable cuspidor that wouldn't spill. A breakthrough occurred sometime after the invention of Styrofoam®, when some paper towels were brought to the south. No one knows for sure who it was that originally put the two together, but this innovation has become a mainstay in most southern pickup trucks. Across the building is the Idea Incubation Complex where thousands of documents, from southern literature, to political speeches are kept. The mainstay of this installation is the Wallace diorama which features scenes from the governor's most shining moments. An animatronic Wallace narrates the fifteen minute show from his wheelchair on the central dais. Visitors can also get a glimpse of the Alabama quarter, showing the same wheelchaired Wallace patting a black child on the head. The Southern Innovation Center is open to the public starting November 30. Regular hours will be Wednesday through Friday from 9AM til 3PM. Special learning tours for school children will be offered on Tuesdays. 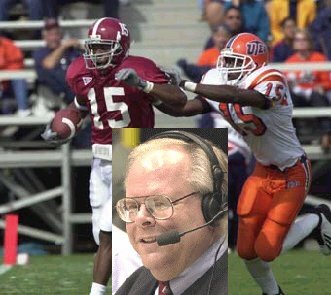 Tuscaloosa() Eli Gold, in partnership with Jefferson Pilot Sports and Keith Jackson Enterprises announced Monday the introduction of a special TV which will allow fans to simultaneously watch Alabama football and listen to Gold's radio broadcasts. The device was designed to remedy a problem that Alabama fans have faced for decades - ignorant television sports commentators. No longer will diehard Alabama fans be subjected to generic banter like "Hey, hey, Jimbo you're so old that when you played football you had to use a real pig." Fans using the new TVs will be able to hear Eli 'The Voice' Gold and Kenny 'The Snake' Stabler provide the knowledgeable, partisan commentary necessary to correctly describe an Alabama football game. This breakthrough was accomplished by means of a specialized comb filter that removes any trace of the offensive TV banter while keeping picture and radio signal in sync. The new function, entitled Bamavision, will be available using the SAP button on properly equipped TV sets. Alabama Athletic Director Mal Moore is an enthusiastic supporter of the new device. "Eli has always had a good knowledge of our ball club," said Moore. "But those TV guys can't even tell the difference between Shaun Williams and Shaud Williams. Besides, I think Musberger always bets against Alabama." Gold hopes to begin distribution of the device in time for Alabama's crucial game against Southern Miss. Gold has yet to decide whether to license the new technology. However, the announcer for Alabama's Iron Bowl opponent is said to be interested. Muzaffarabad, Kashmir() Even before it was released to a global public on the double album Physical Grafitti, the Kashmir issue was creating strife between rival factions of the hard rock outfit 'Led Zeppelin.' Tensions began in 1947 when the British colonies of India and Pakistan gained their independence. Then-maharajah Hari Singh, under pressure from the international community to ally with one of the two new nations, instead acceded Kashmir to a British lad by the name of Robert Plant. Plant, fascinated for decades by Kashmir's natural beauty, eventually brought it to the attention of his band-mates John Bonham and Jimmy Page in the early 1970's. Together they developed Kashmir from a barren yet sublime composition into a majestic guitar riff-driven soundscape - one that has performed phenomenally on the world market, especially in regions where opium and other narcotic consumption is high. While they were working together as Led Zeppelin the trade surplus generated by the newly developed Kashmir was shared equally among the partners. However, disputes over credit for the success began to bubble over, often extending into blood curdling vocal cadenzas, ear piercing guitar solos or seemingly endless percussive experimentation depending on who got the upper hand at each performance. Realizing that the conflict was effectively draining Kashmir of its most precious resources, Bonham and Page both blamed Plant and became increasingly distressed and combative. 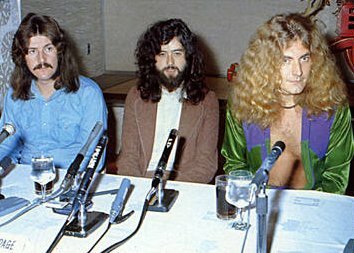 When Bonham drank himself to death in 1980 Led Zeppelin ceased touring. Plant retained posession of Kashmir, but failed to sustain its development and income generating potential. The ballad was wrung through a series of solo tours during which lesser musicians reinterpreted the song without intimate knowledge of its precipitious drops and half-hidden bridges. The result was increasingly muddy and flat, in some cases resembling more the Ganges delta in Bangladesh than the mighty Indus churning through the Himalayas. Unwilling to let his musical investment dissolve completely, Page took the initiative and tried to open negotiations with Plant over the disputed territory. He began remastering previously released versions to highlight his own contributions to the song, eventually drawing Plant out of his self indulgent 'Manic Nirvana' state around 1990. Peace seemed possible that year as Page and Plant cooperated on rebuilding the troubled creation, but the alliance proved short lived. Unable to come to terms, Page mounted an offensive using borrowed vocal artillery from David Coverdale. Plant retreated, able only to form a brief pact with a leaderless 'Queen.' The 1993 album 'Fate of Nations' was Plant's last-ditch effort to insure the future of Kashmir, but it fell on deaf ears. The future of the Kashmir remains in doubt as Page, known to have been seeking assistance from the 'Black Crowes,' has apparently injured his back, leaving a power vacuum at Kashmir's helm - a vacuum into which innumerable would be guitar gods are willing to be sucked.